CCP is giving EVE Online players the chance to do some good in the the real world by donating PLEX to help out with flood relief in Pakistan. 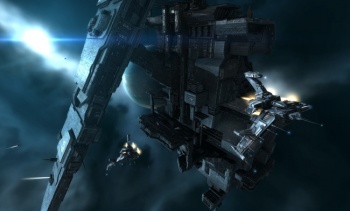 EVE Online players have a reputation as a vicious lot, best known for the devastatingly creative ways they come up with to swindle, screw and slaughter each other in the vast coldness of space. But they're also capable of acts of great charity, as evidenced by the more than $40,000 donated by players to the victims of the Haiti earthquake earlier this year. And now they're at it again. Pakistan was devastated by floods caused by extreme monsoon rains that began in late July and resulted in over two thousand deaths and the destruction of more than a million homes. An estimated 21 million people have been left injured or homeless, more than the combined total of people affected by the 2004 Indian Ocean tsunami, the 2005 earthquake in Kashmir and the 2010 earthquake in Haiti. "The situation for those affected by this tragedy continues to be dire, and many of you have expressed the desire to help these innocent victims using PLEX," Associate Community Manager CCP Fallout said in the EVE Insider Dev Blog. "Beginning September 15, 2010 and ending on October 6, 2010, CCP will be accepting PLEX donations for the PLEX for GOOD: Pakistan program. Each donation will be converted into cash currency and donated to the Pakistan Red Crescent Society, a humanitarian and relief organization based in Pakistan that is working towards helping those affected by the flooding." CCP is famous for its "hands-off" approach to EVE but will be watching closely for anyone who tries to take advantage of the charitable nature of his fellows. "CCP regards any scamming attempts surrounding this effort to be morally reprehensible and they will be met with swiftest action," the studio warned. For more information on how you can help out, have a look at the PLEX for GOOD FAQ at eveonline.com.